Are you looking for a way to make your lawn more green and fresh? Try aerating it. Lawn aerators help create holes in the sticky soil to allow water and fertilizers to go in deeper. They also help sever grassroots and multiply them. With such a laborious task, we can say that the best lawn aerators are those that offer the most ease of use. Lawn aerators come in two different types: core and spike. The former has hollow tires, and the latter has metal spikes. Core aerators remove soil, whereas spike aerators just dig holes by moving the compacted soil away. Removing the soil means that the holes stay open for a longer time, while the holes created from spikes close up a bit quicker. Today, we will take a close look at three manual lawn aerators in hopes to find the best one. We will look at each of their features as well as the pros and cons to determine which offers the most value for money. Soil compaction is a serious problem when it comes to grass root growth. The use of lawn aerators can easily solve this problem by reducing thatch layer and allowing the nutrients from fertilizers to go deeper into the roots. For years, Yard Butler has been among the trusted manufacturers of gardening tools that are simple, affordable, and durable. With their experience in this industry, you can expect that their products are of high quality, such as the Manual Lawn Coring Aerator we are featuring today. This lawn aerator is made using stainless steel, which ensures that it is built to last for years. In fact, you can use it for a long time without any issues nor maintenance requirements. If the core ejector tubes ever get clogged mid-operation, which is highly unlikely if you follow the method carefully, it can easily be cleaned. It removes two half-inch wide and three and half-inch plug cores. It should be pressed into the soil every six inches for better turf growth. Now, we know that using manual tools to get the job done can be quite tiring and put some heavy strain on our backs. Luckily, you won’t have that problem with this lawn aerator. It stands 37 inches high, making it incredibly easy to use since it won’t strain the back muscles. It is also designed with a foot press for better operation. The Punchau Lawn Aerator Shoes is a kind of spike aerator that offers unparalleled convenience. With this, you literally just need to walk on your lawn to aerate it. All you need is these shoes, and your own weight will spike the soil, no hands involved whatsoever unlike other manual lawn aerators. These shoes are designed to fit all other shoes easily. In fact, you can even pair it with your favorite boots for added strength. For a tight and secure fit, these shoes are designed to have three straps with metal buckles. These further ensure that your spike aerator shoes last long enough to be used for years to come. It features a base that is made from heavy-duty plastic, which not only makes it strong but also lightweight enough to be comfortable to wear. These shoes weigh only 2.3 pounds. It comes equipped with 12 two-inch spikes enough to aerate small- to medium-sized lawns easily. The Yard Bulter IM-7C Spike Aerator is the spike version of the Yard Butler core aerator we have presented earlier. It is a simple hand-held tool that requires force from your foot in the foot bar. There are four three-inch spikes that readily penetrate through the soil and create holes for faster aeration. 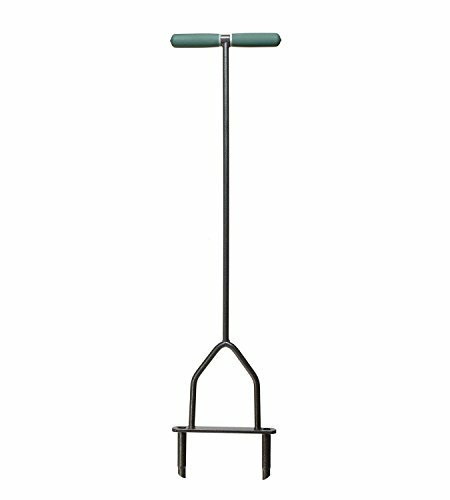 If you are trying to achieve root separation for the grass, this spike aerator tool is perfect. This tool is made from stainless steel and designed to last. In fact, it has a lifetime guarantee so if it breaks you can perhaps get a replacement from the manufacturer. This is yet another high-quality gardening tool from Yard Butler that offers ease and quality. It weighs a little over four pounds. The three best lawn aerators we have reviewed are all manual tools that are budget-friendly but of high quality. When it comes to aerating your lawn, all tools listed above are good options. As they are manual lawn aerators, you may find them a little time-consuming to use, but they get the job done well. For an operation like this that is not done so often, they are of a good value. Depending on your needs you can either choose Yard Butler Core Aerator or Spike Aerator. Both are essentially the same in terms of design and construction. 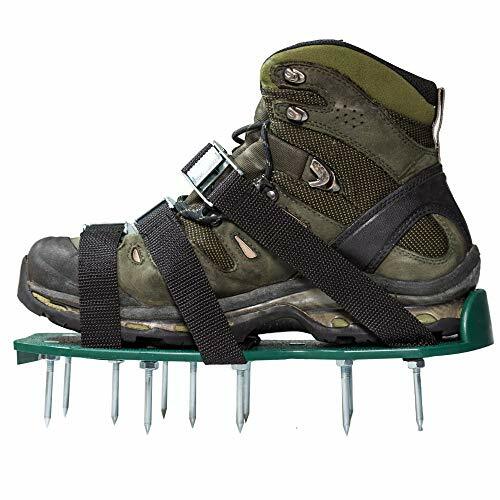 The Punchau Spike Aerator shoes are also quite easy to use and fit well. As is common with manual lawn aerators, you will need to exert force when using these tools, but at the end of the day, the result will be worth it.